Emerald Knit Wrist Leather Palm Gloves provide a durable layer of protection for general applications requiring a tough glove. 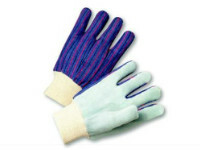 We recommend these industrial gloves for activities such as construction, landscaping, metalworking, mining, and sanitation. With an outer shell made of breathable cotton and a heavy duty leather palm our gloves are an economical option for superior protection and usability. Emerald Leather Palm Gloves are also gunn cut. The gunn cut pattern features a single-piece, seamless backside with fine seams away from the palm area. Middle fingers are sewn into the palm separately to increase dexterity for the user. This design also provides better wear and increased comfort. Additionally, gunn cut patterns minimize stress on the glove, providing increased durability and enhanced grip for handling tools. Available in bulk pack and tagged options, medium weight Emerald Knit Wrist Leather Palm Gloves are packaged 12 dozen pairs per case.